Becoming a thought leader requires consistency of effort. Here are some tips that will help. Like any other type of work, executing and maintaining valuable thought leadership requires effort, intention, forethought and planning. Those who wait for inspiration to strike are likely to end up with much less output in the long run. The thoughts, wisdom and experiences you write about are yours; make sure they are utilized to the utmost by keeping your thought leadership process organized. One of the biggest pointers I can give you for successful writing is to jot down your ideas when they strike. We all tend to think that we will remember our ideas, but our memories usually aren’t as good as we expect them to be. Always keep note-taking equipment on you: keep a notebook in your bag, a list of ideas on your phone, and something beside your bed for late night inspiration. After you have begun taking notes of your ideas, the step of planning out series can come naturally. When an inspiration strikes you, examine it further for related points to write about, or for ways to divide that idea into separate, standalone posts you can put together into a cohesive series. What else would people want to know about that topic? How many posts would be ideal in order to explain your points the most clearly? Begin thinking about these things and noting them down accordingly. This third point naturally flows from the first two. Once you have begun jotting down all of the ideas you get and organizing them into coherent series, a big part of the work of scheduling posts in advance will already be done for you. I tend to advise executive thought leaders to write a new post weekly if possible, or at least monthly. You want to remain in the minds of your readers, and long breaks between postings will not help you in that goal. No one becomes a thought leader through scattershot efforts. 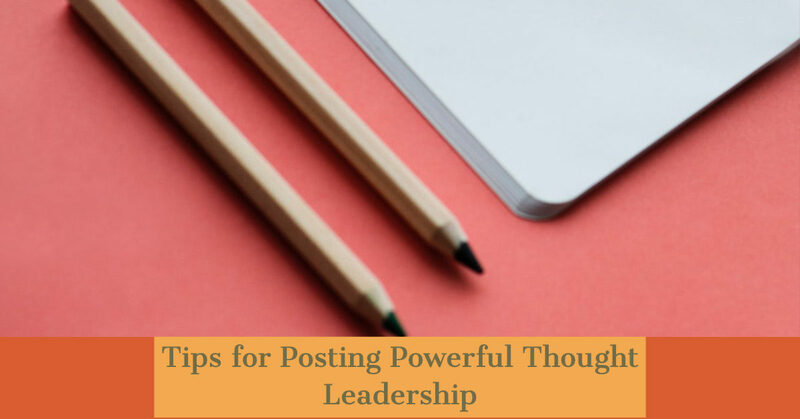 Keep a consistent schedule of posting your thought leadership, and that schedule can come straight from the notes you’ve been taking. Before actually writing a post, outlining it can help you ensure that your post is coherent, organized, and complete. Before writing you should also choose the format in which you want to write. Ideally, each of your posts should feel like they connect; they should sound like they were written by the same writer. As a thought leader, you want people to be able to identify your voice, to know what you sound like. Part of that comes from the format in which you write. This is one good online source for format ideas. You can also alternate between different formats and styles — as long as you do so skillfully and in ways that still give you a cohesive voice, so that your readers know what to expect from you. These ideas will help you develop and maintain content as a thought leader. All that is left now is to write well, post strategically, and share widely. I’ll share more about this process in the future, and as always, feel free to reach out for help with establishing your own thought leadership.